198. Santa Claus Parade and Sweden’s Santa Lucia Festival. Two events start the Christmas season in Toronto today. 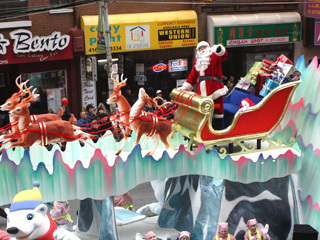 The Santa Claus parade goes off with dozens of marching bands and fairytale floats from Bloor and Christie at 12:30 noon. The route is east on Bloor Street, south on Avenue Road, and east on Wellington. It will be full of multiracial participants waving to one of Toronto’s largest crowds. If it’s like previous years, the proportion of non-Caucasion children in the parade will not be in proportion to the population, alas. Please let us know if this is your perception too. It will be a fun parade, but it will be very commercial, encouraging shoppers to think about buying gifts for Christmas. But will there be a creche with the baby Jesus who grew up to preach love and forgiveness? Sweden's Santa Lucia. Image©Ruth Lor Malloy 2011. On the other hand, the Swedish Santa Lucia Festival, on at Harbourfront from l1am to 4pm, will be less frantic and more peaceful. It will be beautiful rather than glitzy. 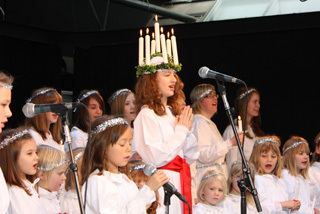 Young women will parade slowly with lit candles on their heads, followed by little girls dressed like angels in white. Folk dancers in costume will dance on the stage. They will be commemorating the courageous woman from Sicily who refused to give up her Christian values in the face of death. This festival is celebrated in other European countries as well: Denmark, Italy, Latvia, Estonia, Finland, Hungary, Malta, Bosnia, Bavaria, Croatia, Slavkia and St. Lucia, West Indies. See: http://torontomulticulturalcalendar.wordpress.com/2010/11/16/november-20-21/ for last year’s report. I’d be more interested in the Santa Lucia festival, I think. I remember as a child traveling from Helsinki to the Netherlands for Christmas through Stockholm, which was even to my young eyes, the most beautifully decorated for this season, all in white. I also once performed the song Santa Lucia solo, but I can’t remember who the audience was… perhaps the veterans from the hospital down the street from The English School in Helsinki I attended. PS. The song is pretty and you can here it HERE. Many thanks for the comments. I wish you could have been in Toronto today to hear the beautiful singing of Toronto’s Swedes.